The Federal Open Market Committee, the panel that sets interest rates, suggested in its last meeting that the central bank could keep rates at ultra-low levels for even longer than investors anticipate if the economic outlook worsens. “The decision by the Federal Open Market Committee (FOMC) at the January meeting to keep the target range for the federal funds rate unchanged and to retain the “extended period” language in the statement was widely anticipated by market participants. However, investors reportedly read the statement’s characterization of the economic outlook as somewhat more upbeat than they had anticipated, and Eurodollar futures rates rose a bit in response. The changes to the terms for primary credit and the Term Auction Facility that were announced on February 18 resulted in a small increase in near-term futures rates, but this reaction proved short lived, as the statement and subsequent Federal Reserve communications— including the Chairman’s semiannual congressional testimony—emphasized that the modifications were technical adjustments and did not signal any near-term shifts in the overall stance of monetary policy. On balance, incoming economic data led investors to mark down the expected path of the federal funds rate over the intermeeting period. By contrast, yields on 2-year and 10-year nominal Treasury securities edged up, on net, over the period. Yields on Treasury inflationprotected securities (TIPS) rose at all maturities, reportedly buoyed by investor anticipation of heavier TIPS issuance and by reduced demand for TIPS by retail investors. Reflecting these developments, inflation compensation— the difference between nominal yields and TIPS yields for a given term to maturity—declined over the period, a move that was supported by the somewhat weaker-than-expected economic data and the publication of lower-than-expected readings on consumer prices. Conditions in short-term funding markets remained generally stable over the intermeeting period. Spreads between London interbank offered rates (Libor) and overnight index swap (OIS) rates at one- and three-month maturities stayed low, while six-month spreads edged down somewhat further. Spreads of rates on A2/P2- rated commercial paper and on AA-rated asset-backed commercial paper over the AA nonfinancial rate werealso little changed at low levels. The Federal Reserve continued to taper its large-scale asset purchases and wind down the emergency lending facilities with no apparent adverse effects on financial markets or institutions. The FOMC also said that inflation “would be subdued over the near term,” as the Fed has been saying for some time. Participants agreed that financial market conditions remained supportive of economic growth. 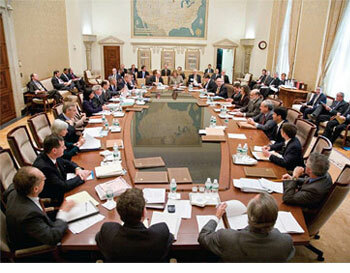 In their discussion of monetary policy for the period ahead, members agreed that it would be appropriate to maintain the target range of 0 to ¼ percent for the federal funds rate and to complete the Committee’s previously announced purchases of $1.25 trillion of agency MBS and about $175 billion of agency debt by the end of March. Nearly all members judged that it was appropriate to reiterate the expectation that economic conditions— including low levels of resource utilization, subdued inflation trends, and stable inflation expectations—were likely to warrant exceptionally low levels of the federal funds rate for an extended period, but one member believed that communicating such an expectation would create conditions that could lead to financial imbalances. No decisions about the Committee’s exit strategy were made at this meeting, but participants agreed to give further consideration to these issues at a later date. Voting against this action: Thomas M. Hoenig. “Mr. Hoenig dissented because he believed it was no longer advisable to indicate that economic and financial conditions were likely to warrant “exceptionally low levels of the federal funds rate for an extended period.” Mr. Hoenig was concerned that communicating such an expectation could lead to the buildup of future financial imbalances and increase the risks to longer-run macroeconomic and financial stability. Accordingly, Mr. Hoenig believed that it would be more appropriate for the Committee to express its anticipation that economic conditions were likely to warrant “a low level of the federal funds rate for some time.” Such a change in communication would provide the Committee flexibility to begin raising rates modestly. He further believed that making such an adjustment to the Committee’s target for the federal funds rate sooner rather than later would reduce longer-run risks to macroeconomic and financial stability while continuing to provide needed support to the economic recovery.